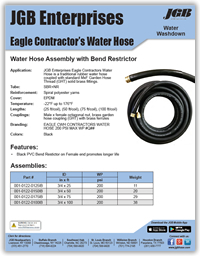 Eagle Contractors Water Hose - JGB Private Brand - Hose by Vendor - JGB Enterprises, Inc. Designed as a traditional rubber water hose coupled with standard MxF Garden Hose Thread (GHT) solid brass fittings. This hose assembly also comes with a bend restrictor.